Caitlin Kams, an employee at La Verne Brewing Company, said that she and the other employees joke that their brewery is like the 1980s sitcom “Cheers,” where everybody knows your name. The fast-growing brewery industry has made notable impact in La Verne and its surrounding communities in recent years. 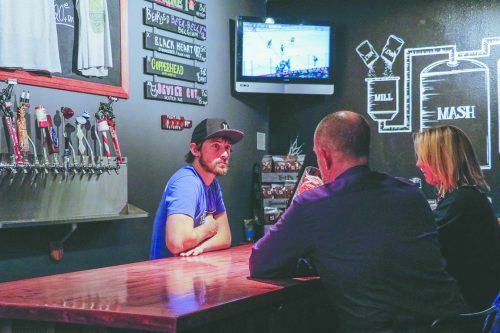 Lawren Markel, spokesman for the Los Angeles Economic Development Corporation, or LAEDC, said consumers are looking for something different, flavorful and local, which are categories breweries strive to succeed in. With over 10 million residents in L.A. County, there is a large market for the flourishing industry. “It’s nice that there’s a place that is safe, as well as nice and close,” said Liz Tikriti, a physician’s assistant student at Western University of Health Sciences. Tikriti was visiting Sanctum Brewing Co. with her friend and Western University classmate Andrew Beatty, last Wednesday evening. With a social and trendy culture, breweries attract both beer enthusiasts and amateurs alike. Beatty said he heard about Sanctum through a classmate and brought Tikriti along to experience the brewery for her first time. Beatty, 28, of La Verne, and Tikriti, 27, of Pomona, both enjoy traveling to nearby breweries, and look for those with a great social scene. Most breweries provide games and entertainment to make their establishment more appealing. Sanctum Brewing Co. offers “InHouse Trivia Night” every Wednesday and periodically, a pun-intended dish night, like their Baby Come Back Ribs over the weekends. It is customary that breweries are housed in the industrial areas of communities. However, sometimes these large buildings with individual spaces sit unoccupied, making the area seem eerily vacant. “Utilizing space that’s ordinarily being occupied, like industrial areas, is a good thing,” Beatty said. Sanctum Brewing, at 560 E. Commercial St. in Pomona, is in a smaller space, but is equipped with ample indoor seating areas, as well as an outside patio. The roped twinkling lights brighten the intimate yard where customers can enjoy games like pinhole and oversized jenga. La Verne and surrounding cities have a large student population from universities such as the Claremont Colleges, Western University of Health Sciences and Cal Poly Pomona and University of La Verne. Breweries like Homage Brewing in Pomona gain popularity from students at these schools that often look for places that have a relaxed environment with good drinks and food. “If your city becomes a destination city, people are going to get hungry and bored, and they’re going to look for stuff to do,” Homage manager Kyle Delacruz said. Delacruz said that Homage and its location benefit from being in the heart of the Arts Colony in downtown Pomona, especially from shows that are hosted by nearby venues like Fox Theater and the Glass House. The two music venues host a variety of artists and acts throughout the year, which bring large crowds to nearby businesses like Homage. “We look like a coffee shop with a chill place to hang out, which is the vibe we want to give,” Delacruz said. Delacruz said since he is an employee of a brewery, he associates with many other local breweries and that there is a community within the industry. People in the brewing community enjoy learning about the craft as much as they do indulging in the product. “It gives you a sense of place,” Kams said, adding that there is a real sense of community with their regulars, and that she and her associates try to give new customers the same feeling. Most breweries like La Verne Brewing allow families with children under 21 to enter, which Kams said is actually a benefit of their location. “It’s nice that I can have a family in the back, open the bay doors and let the kids play baseball or ride their scooters without worrying they’ll get hit,” Kams said. Kams said there is an all women owned and operated brewery called Dragon Tales Brewery in Montclair that has a large following. Like Homage, La Verne Brewing finds the importance of having a strong communal bond in their industry. Kams said that she enjoys going to other breweries to try new items and talk about the business. “If someone is missing a shipment, we help them out. If there are new laws being put in place, we talk about it. We want each other to do well,” Kams said. Catalina Diaz can be reached at catalina.diaz@laverne.edu. Once again, Catalina Diaz wrote a wonderfully, articulate article. It is very informative . Looking forward to Ms. Diaz’s next piece.